Hydrologists Tackle a Deceptively Simple Question: Where's the Water? Knowing just how high a river is flooding during severe storms or how empty it gets during a drought is absolutely essential for emergency managers to make informed decisions, but to get that data someone had to brave the rivers. It doesn’t even matter if a river is flooding its banks or so dry that it’s more of a river-that-was, either way U.S. Geological Survey hydrologists are going to be scrambling around measuring how much water (or lack thereof) is flowing how fast. 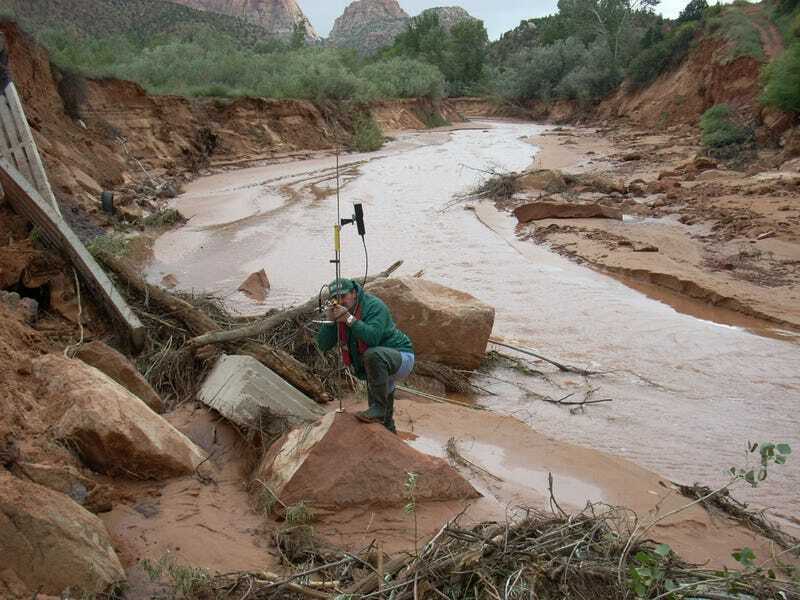 This month, hydrologist Brad Slaugh, headed to southwest Utah to collect streamflow measurements during a deadly flash flood . This real-time data was fed to emergency managers and the National Weather Service flood forecasters to better understand the impact of the storm. But it’s not all sogginess this winter. Not too far away in Idaho, another USGS hydrologist had a far easier time measuring streamflow in a dry river bed. The drought has hit Lightning Creek Hard, leaving dry rocks and a flow between nill and nothing. This is just one of hundreds of sites throughout the western United States being monitored to analyze the current drought and better predict future droughts. You can read the USGS handbook on streamflow measurement techniques here.